Another series of File System Translators for the Apple IIgs: DOS 3.2, DOS 3.3 and rDOS 3.3. DOS 3.2 is a new File System Translator. It is a read-only FST and in a few kilobytes, the user is able to view and copy all of the files contained on an 5.25 disk. DOS 3.3 is an updated File System Translator. 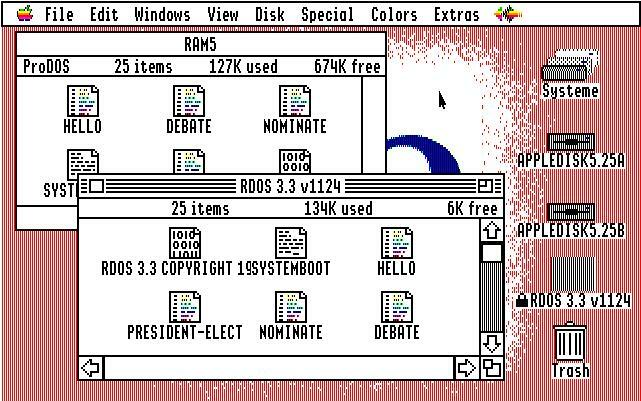 It supports formatting and erasing and in a few kilobytes, the user is able to view and copy all of the files contained on an 5.25 disk. rDOS 3.3 is our first File System Translator. The rDOS operating system is (c) Roland Gustafsson. It is a read-only FST and in a few kilobytes, the user is able to view and copy all of the files contained on an 5.25 disk. 20090903: Please find a PDF version of the documentation thanks to Bill G.